*UPDATE* This event is taking place on the 25th, not the 24th as posted. 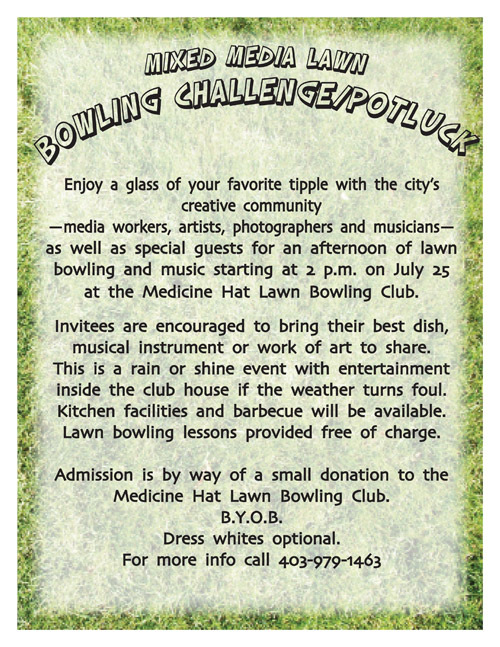 Enjoy a glass of your favorite tipple with the city’s creative community – media workers, artists, photographers and musicians – as well as special guests for an afternoon of lawn bowling and music starting at 2 p.m. on July 25 at the Medicine Hat Lawn Bowling Club. Invitees are encouraged to bring their best dish, musical instrument or work of art to share. This is a rain or shine event with entertainment inside the club house if the weather turns foul. Kitchen facilities and barbecue will be available. Lawn bowling lessons provided free of charge. 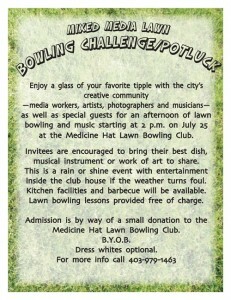 Admission is by way of a small donation to the Medicine Hat Lawn Bowling Club. I have always wanted to learn how to play lawn bowling… So whether you are a reporter, tv/radio host, photographer, artist, musician or any other type of media worker, stop by with some food and drinks, and well, play some lawn bowling, or maybe a little bit of croquet? This entry was posted on Tuesday, July 20th, 2010 at 1:39 PM and is filed under Art Events, Music Events, Other Events, Sporting Events. You can follow any responses to this entry through the RSS 2.0 feed. You can leave a response, or trackback from your own site.